LYTD | What Does LYTD Mean? 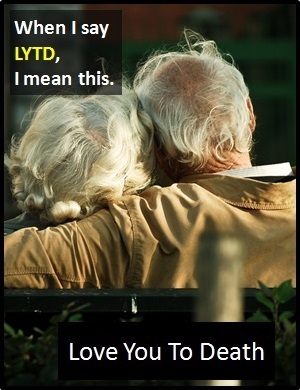 LYTD means "Love You to Death". The abbreviation LYTD is used to express deep, intense love. It implies that the feelings of the sender are so intense that they might die from them. LYTD is typically used between love-struck teenagers, but is also sometimes used in a more jokey way between mature couples. If the feelings are not reciprocated, LYTD may be considered as creepy or even threatening. LYTD is another way of saying "I love you so much". Phil: How long will you love me? Phil: That's a bit creepy. Person A: If I had a star for every time you brightened my day, I'd have a galaxy in my hand. Person B: Your cheesy lines are why I LYTD. The abbreviation LYTD is often used as a declarative sentence (i.e., statement). It is not always used as a part of speech in a wider sentence. LYTD is an�initialism abbreviation. Technically, this means it is pronounced using its individual letters (i.e., "Ell Why Tee Dee"), but it is not spoken using its letters. In other words, the abbreviation LYTD is for efficiency in writing and not efficiency in speech. Before the digital era, we might have said something like "I will always love you" instead of LYTD.